Airservices intends to implement small changes to the standard instrument arrival flight path to Brisbane Airport for aircraft arriving to Runway 19 from the north. These changes are to ensure pilots can keep the aircraft in autopilot when descending to the airport from the north, and that tracking and speed are consistent for all aircraft as they approach the runway. Aircraft will fly the existing approach shown below in Figure 1, with a small change in lateral tracking. 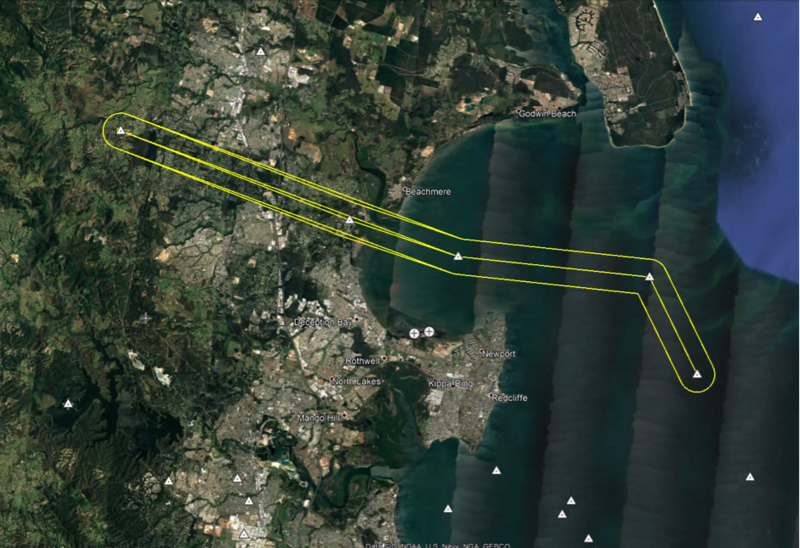 Following consultation Airservices has implemented changes to the standard instrument arrival flight path to Brisbane Airport for aircraft arriving to Runway 19 from the north. For more information please see the Brisbane Airport Implementation of Changes to Runway 19 fact sheet under Downloads. 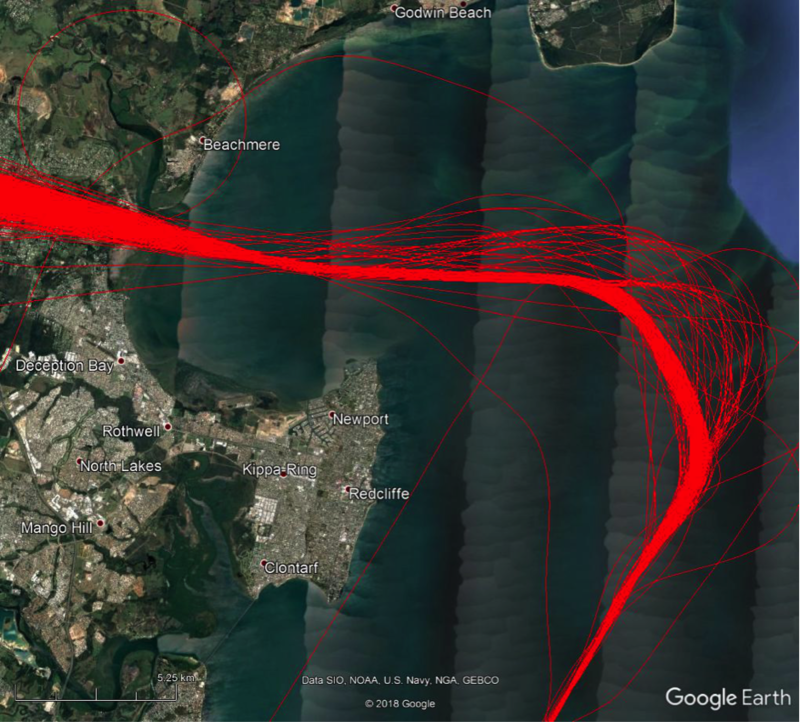 To provide consistent tracking and speed with other arrivals to Runway 19, the arrival flight path from the north will be moved 200m.This change will occur around the area where the aircraft crosses the coast line at Deception Bay. Residents in this area and in the areas of Kippa-Ring and the Redcliffe Peninsula may notice a visual change, however a change this minor is difficult to discern from the ground. Figure 2 below shows an indicative representation of the flight path with the 200m lateral change. An additional change is also needed to accommodate the requirements for the aircraft to effectively utilise autopilot on the approach. A change is required to the Lowest Safe Altitude (LSALT) level over the coast and water from 3700ft to 3000ft. The LSALT is calculated for flight paths as the minimum possible altitude that can be flown so obstacles or terrain can be given a safe buffer region. The requirements for making these calculations are set in regulation by the Civil Aviation Authority (CASA). Aircraft do not commonly fly at LSALT. Will there be any change in aircraft noise? Should the aircraft be required to fly LSALT over the coast line and over water to the runway, it is predicted that a noise level change of 1.8dB(A) will result from the lowering of the LSALT from 3700ft to 3000ft. It is also possible in rare and unlikely circumstances, that a pilot may choose to make a quick descent over the coast line and out over water towards the runway. Aircraft are currently crossing the coastline at an average of 5,402ft, however a quick descent may result in the aircraft being at 3,000ft and flying at that altitude until turning towards the runway. This change in altitude would result in a maximum noise level increase of 5.1dB(A). Should this unlikely event occur residents in the Deception Bay area and on the Redcliffe Peninsula may notice the increase in noise levels. When will this change start? It is anticipated that the changes will be implemented on 8th November 2018. Where can I get more information or provide feedback on the change?